If you're a naturally caring person and enjoy working closely with other people, then a career in nursing could be for you. Nurses are a very valuable part of our society and working in the industry can be very rewarding. We've put together this post to provide you with a detailed overview of how to become a nurse and what the job entails. What types of nursing jobs are there? As the name suggests, this role involves nursing people from ambulance vehicles. As an ambulatory care nurse, you could find yourself helping people who have a medical emergency or are in labour. Midwifes work specifically with expectant mothers. There's a lot more to being a midwife than simply delivering babies. As a midwife, you'll be responsible for providing nursing care to families throughout a pregnancy. For more information, take a look at our post How to Become a Midwife. A dermatology nurse works specifically in the field of skincare. As a nurse, you may want to consider specialising in a specific are of nursing that particularly interests you. Neuroscience is all about the human brain. As a neuroscience nurse, you'll be responsible for supporting neuroscientists and doctors in caring for neurosurgery patients. This list only really scrapes the surface of the various different types of nursing jobs that are out there. For a more comprehensive list of nursing jobs, take a look at the Discover Nursing website. In order to become a nurse, you'll need to study at medical school. To be accepted on to a nursing course, you'll need to have good A-level passes in maths, English and science subjects, particularly biology. Every nursing course has a slightly different entrance criteria, so you should always check with individual universities before applying. To qualify as a nurse, you will need to complete a Nursing and Midwifery Council (NMC) approved course in nursing. A typical nursing degree takes 4 years to complete and you may be required to undertake work placements during this time, depending on the type of nursing course you apply to. To help increase your chances of securing a place on a nursing course, you may want to consider gaining some experience working in a hospital, carrying out first aid and working with children. What does nurse training involve? 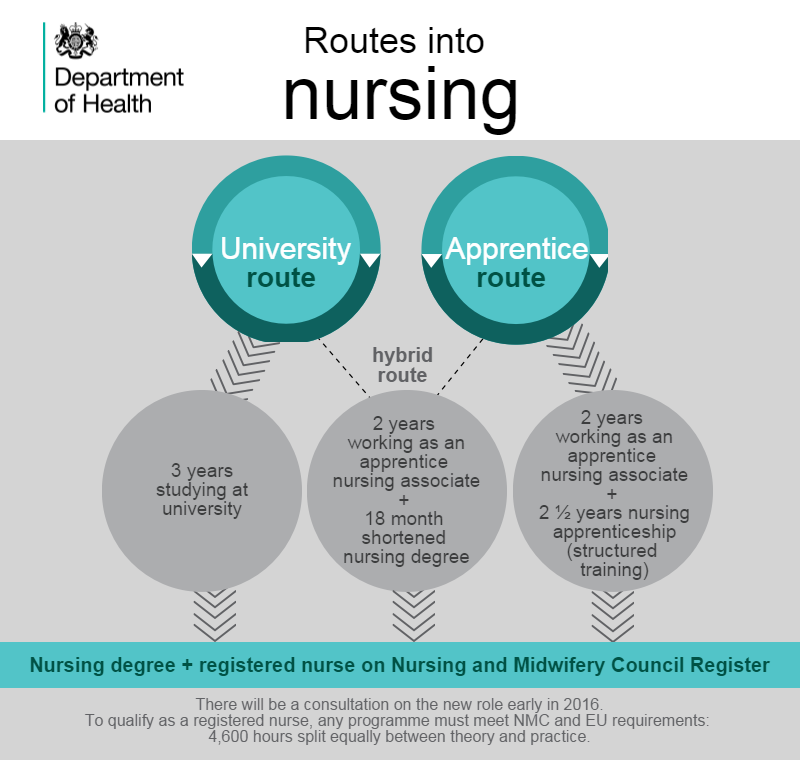 Once you've completed your degree in nursing, you'll need to register with the Nursing and Midwifery Council in order to practice as a nurse. Once you have secured a nursing job, the NMC offers training opportunities for you to develop your professional career. After qualifying, many nurses go on to specialise in specific areas of nursing such as mental health, cardiac or neuroscience. Nurses are typically patient, caring people who enjoy working with the public. A large part of your job as a nurse will involve interacting with patients. You should be able to put people at ease and have a calm demeanor. As well as talking with patients, you'll be working as part of a team with other nurses and doctors. You'll need to communicate messages clearly and accurately while taking instruction yourself. As a nurse, you'll be working as part of a team of nurses, doctors and surgeons so you'll need to have a positive attitude and be able to give and receive constructive feedback. Nurses are often faced with challenging decisions on a daily basis. You'll need to be able to think on your feet, show initiative and keep calm in upsetting situations. According to the website PayScale.com, the average salary of a nurse in the UK is £23,038. If you choose to specialise in a certain field of nursing, your salary will generally be higher.